We are often asked which is better: a monohull or a catamaran? The answer is neither one is better or worse than the other, they are just different; each with its own advantages and disadvantages. We understand the differences, and can teach you how to handle a cruising cat both sailing and in managing in a tight marina environment. This course will involve learning close-quarter maneuvering, reefing, man-overboard, sailing a catamaran, managing the boat systems; and a myriad of catamaran specific techniques to help you become familiar with this wonderful cruising platform. 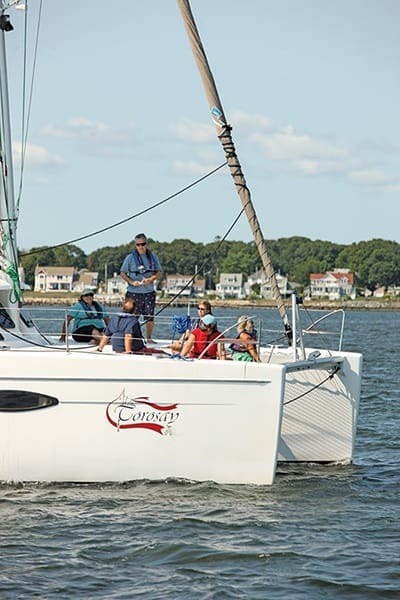 You can add ASA 104 to the Cruising Catamaran course on the above dates to make it a 104/114 combination course, totaling five days of instruction. The cost is an additional $1,000 for one or $1,500 for two (meaning a total of $2,500 for one person or $4,000 for two).